I will mainly talk about what I saw and heard, and what was noteworthy.There were many other artists there and this review is not to take away from those not mentioned. But, as the bands were split up between 4 stages, there is no way to see everything. Stealing the show this year were many local acts.So here we are at an old farm tucked away in the suburbs of Philadelphia, and I have no idea the treasures that will be uncovered. Thriving on their local presence, the Spinning Leaves kicked off Friday with a bang.They put on a great set, throwing love around like modern day cupids.Their awe-inspiring, comforting vocal harmonies and energetic acoustic guitar parts made me feel as if they were in my living room playing solely for me. Also noteworthy, but for the wrong reasons, Bonnie “prince” Billy made for one of the only sour points throughout the four days.His long, uninspired, and sometimes downright weird set put most in the crowd to sleep.At a festival of this magnitude there are bound to be some that don’t live up to expectations and this was one of them.What made his performance particularly unsettling was that he was the 2nd to last performer of the night, which didn’t make it easy for Gandalf Murphy and the Slambovian Circus of Dreams to close the night with authority. I’m pretty sure Bonnie “prince” Billy overstayed his welcome on stage as well, leaving less time for Gandalf to play.Regardless, Gandalf and his Slambovian Circus still put on a classic set.Their often hard-to-pin-down style of music ranges from hillbilly rock to country folk to pink Floyd grandness. They put a nice cap on the first day of music at the fest. But of course, the music did not end; the night sent siren sounds flowing through campsite and tent city till the wee hours of the morning. Saturday opened again with some great local acts on the camp stage. Mason Porter, a blues, bluegrass, and folk revival band from West Chester, PA really impressed the crowd and me.Their stage presence and originality was manifested prominently as they left the Philly Local showcase stage humming. And left the crowd with something to talk about.Following was the Dave Quicks Trio.The trio is derived from members of the Burndown Allstars (Dave ownes the Burndown recording studio) and Princes of Babylon and immediately evokes comparisons to G Love and Special Sauce.This in itself is not very surprising, given the fact that Princes of Babylon had been brought up on G Love’s Philadelphonic label.What was intriguing was their interesting blend of rock, blues, reggae, and funk that had many in the audience moving to the music. Jeff Tweedy, best known for heading up the band Wilco, came to town to play a highly anticipated, and also very rare solo acoustic set.Tweedy danced through some Wilco tunes peppered with some other solo stuff. Erin McKeown had a couple of friends join her on stage.Some very popular and musically talented friends in Teresa Levasseur, Susan Werner, and Natalia Zukerman.These four women had obviously come to play as they rollicked, picked, and downright rocked the crowed as night fell upon the festival main stage.The Harlem Blues and Jazz Band rocked the house next. The swing band brought 37 years of performing wisdom to the stage. Taj Mahal closed the night out. And for good reason.Taj never ceases to amaze me.He picked his way through 40 years of material ranging from blues, roots, and calypso to rock and folk.I love the fact that he is still extensively touring, doing as many as 150 shows a year worldwide.He is one of the most beloved and prominent figures in rock history and it’s not hard to see why.His stories, banter, and stage presence is captivating to say the least. Cheers Elephant and Kyle Offidani, local bands and part of the Philadelphia Folk Co-op, both blew me away on Sunday.I had heard of Cheers, never of Kyle.But word around the folksong society was that he was an up-and-coming guitar-picking prodigy and I got a chance to experience that first hand. Kyle, a 23 year old from northern Delaware, ripped up the stage, slapping and picking and doing things to his guitar I had never seen.Especially from someone as young as him.As the rain forced many festival goers under the tent, Kyle pounded away on his guitar.The growing crowd of amazed faces cheered with excitement as he taught them all a lesson. Jaws dropped and hands clapped.Later in a conversation we remarked how a simple twist of fate had brought the rain and the crowd to fill the tent stage while he was playing.Cheers Elephant followed and was probably one of my favorite performances of the festival.If the Kinks and Bob Dylan had a musical child and that child married the Strokes then divorced them to marry Vampire Weekend, that would be Cheers Elephant. Their endless energy and ability to move a crowd was mind boggling to watch.The heart of the band, the hype man, was an unlikely pick. He was a long-haired dude in a suit that rocked the tambourine throughout, crashing the symbols at times and jumping around like a child. I realized that they required his presence after he walked off stage for a second at one point to wipe the sweat that was pouring off his body and the other band members began asking where he was! I will definitely be catching Cheers Elephant and Kyle Offidani again soon. One of the workshops was called Under the Covers and featured Lee Harvey Osmond, Iain Matthews, Joe Pug, and Joel Zoss.I had the pleasure of catching this workshop put on by the good people at the fest.Although the slated time for this set unfortunately was during the hardest rain that the festival got all weekend it didn’t seem to faze the crowd that gathered to see these folk and rock legends, new and old strut their stuff.Those in attendance caught a quick glimpse of what was to come with Iain Matthews and Joe Pug.The four took turns playing tunes from Neil Young, Gram Parsons, the Beatles and many others.It was truly a treat to see.Joe Pug, the young, super-talented singer songwriter from Chicago lended his bare-boned, heartfelt lyrics to the folk fest stage for the second year in a row.That in itself is a real testament to the respect that his songwriting and performing abilities are garnering from his constituents and that are quickly taking him to the forefront of the new folk movement.His profound, sincere lyrics and energetic delivery brought the feeling of listening to a young-faced Bob Dylan when he first hit the stage at the Newport Folk Festival 40 years ago. 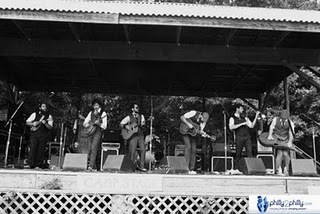 The Oklahoma based, Rockin Acoustic Circus showcased their young skills on the main stage.They captivated the crowd with their fun-filled, dance-folk rhythms and left them wanting more. But the buzz on the festival grounds on the final day was that they could not wait to hear the headliner.The legend that was just named by Rolling Stone Magazine to be one of the top 10 guitarists of all time.I’m talking about Richard Thompson. He graced the Folk Fest stage for the 2nd time in four decades Sunday night and fittingly closed out this years festival with a multilayered solo acoustic set that brought the house down. This years’ Folk Fest cannot be summed up strictly by the artists that were there.It cannot be summed up by the campers or the weather.I believe we can recap the festival though, in its most comprehensive sense, by a feeling that I’m sure was felt by many or most of the festivals participants. So here it is: You know when you’re in a groove?Things will kind of be just floating around and you grab a hold of “it” as it’s passing?Duane Allman used to call it “hittin’ the note”.When the stars align and everything is in perfect tune and tone. Now those great grooves are always flying by, but sometimes, sometimes, you can catch one and ride it till morning. That is the folk fest in a nutshell.So put it in your calendar for next year.It is a festival you will not want to miss.This year was the 49th annual festival.With next year being the 50th anniversary of this iconic fest, you can bet on some magic occurring. Good evening folks! Big things have been happening in Shady Groove Land. For the last 4 weeks I have been frequenting the many festivals, carnivals, and county fairs that the summer has to offer and it has definitely had me feeling like a carney of sorts. So as this past weekend wrapped up my past month of carney living, I found myself at one of the nations oldest Folk Festivals, The Philadelphia Folk Fest. 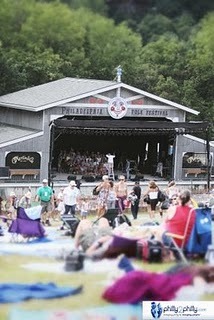 In fact the Philly Folk Fest is now the longest continual running music festival in North America. Beginning in 1962 as a celebration of the folk arts, fans have been heading up to Old Pool Farm in Schwenksville, PA to camp, play, listen, relax, live and learn the best folk music around. DJ Gene Shay was there when it began in 1962 and he was there this year; 49 years consistently serving as master of ceremonies. This being my first time as a Philly Folk Fest attendee, I was fascinated by the good-natured, non-commercial, environmentally friendly, and overall laid-back feel of the festival. My first impression was of utter surprise at the amount of people that were camping when I arrived on Thursday night. The campsite was PACKED and the festival didn’t even start until Friday. Tent city was in full effect and many of the campers had been there since Monday! Pre-fest, which is what I had arrived for, was an event solely for the festivals campers. And there to kick-off the 49th annual festival was local hero, Hoots and Hellmouth, who headlined the camp stage that night. The Pre-fest volunteers and campers are notoriously the most rowdy and riotous fans and this night was no different; we were ready to go! Hoots did not disappoint, biting and feeding off the energy of the crowd with a rollickin’, barn-stompin’ great set filled with such amazing energy that is quite honestly, absent from many live bands these days. That really set the mood for the whole weekend. As much as I thought that Hoots’ energy level that kicked off the festival could not be reached again, I was proved wrong several more times throughout the weekend. For me it was the not simply the bands and artists on the festival program that made the festival so special. I was honestly taken aback by the incessant energy and musical prowess demonstrated by the people in tent city. I would say just about 70% of the people camping had an instrument of some sort. If one had an instrument, they played it. Many brought guitars, mandolins, hand-made dulcimers and drums, tambourines, clarinets, recorders, alto and soprano saxophones, congas, bongos and just about any instrument you can think of. Our campsite was actually directly across from the campsite of Philadelphia Jug Band who came complete with kazoos, washboards, and of course, glass “jugs”. The legendary Jug Band is a group of 60 and 70 year olds who have been attending, camping, and of course playing at the Fest for 40+ years. This band of iconic, folk elders and countless other passerby’s played every night of the festival from midnight to around 3am and drew a crowd each time. It was truly amazing to me the kind of camaraderie and wise musical prowess that was displayed by the group; the kind that only 40 years of playing together will produce. If I had gone to the festival and strictly saw the Jug Band I would’ve been happy. But there is more. So much more…..
Aside from the Jug Band and its followers, one could walk down the roads and trails of the campground and find another jam session happening a few yards away. It seemed that if one had ever owned or played an instrument of any kind they were apt to be jamming at some point during the 3-day festival. Everyone played, everyone sang, everyone drummed, everyone learned, everyone listened. We were all musicians this weekend. It was a spectacular display of good-natured fun and love of music. As I walked around I was many times left speechless by the wonderful happenings that were taking place. Late-night dance parties and jam sessions that lasted till the sun came up were an every night occurrence. Many of the festivals bands on the program were also seen and heard in the campground on numerous occasions. Some bands actually camped with the rest of us. Most of the campsites also had great names such as “Fish Pro Crow”, “Kom Say Hai”, and “Who Hill” to name a few. I honestly cannot say enough about the overall mood and experience of camping. Oh, beautiful tent city, how you quench my thirst. I am left completely satiated.